During the height of the Great War in Europe, the Connecticut press was flush with headlines promoting and recording countless examples of war work. As Washington began sending troops abroad, various media outlets, social clubs and medical organizations, as well as the State of Connecticut, called upon women at home to rise to the occasion and mobilize. Women contributed to the war effort in the areas of food conservation, fundraising, registering women for work in the field and factory, and public health and hygiene. Some organizations even appealed to the wanderlust of American women, and sent them abroad working as ambulance drivers and nurses for the Red Cross. Young women jumped at the opportunity to “do their part” for the war effort. Prior to the outbreak of war, during the period generally termed by historians as the Progressive Era, Connecticut was abundant with women’s organizations and civic-minded movements. The federal and state governments appealed to these various civic groups for their help in defense efforts and the response of women has been cited as crucial to the acceptance of woman suffrage in the post-war period. Nevertheless, not all Connecticut women rallied to support the war; some organizations opposed U.S. entry into the war, or expressed ambivalence. Organizations such as the Woman’s Peace Party were formed in response to the coming of American intervention in World War One. The Connecticut Woman’s Suffrage Association (CWSA) temporarily lost the more radical wing of its leadership in response to the war. President Katharine Houghton Hepburn and Treasurer Josephine Bennett resigned their positions with the CWSA, citing their reluctance to see the subordination of suffrage work to war relief during the military conflict. During the war, radical suffrage leaders collaborated with Bridgeport trade unionists to send Connecticut women to picket for the woman’s vote in Washington, D.C. 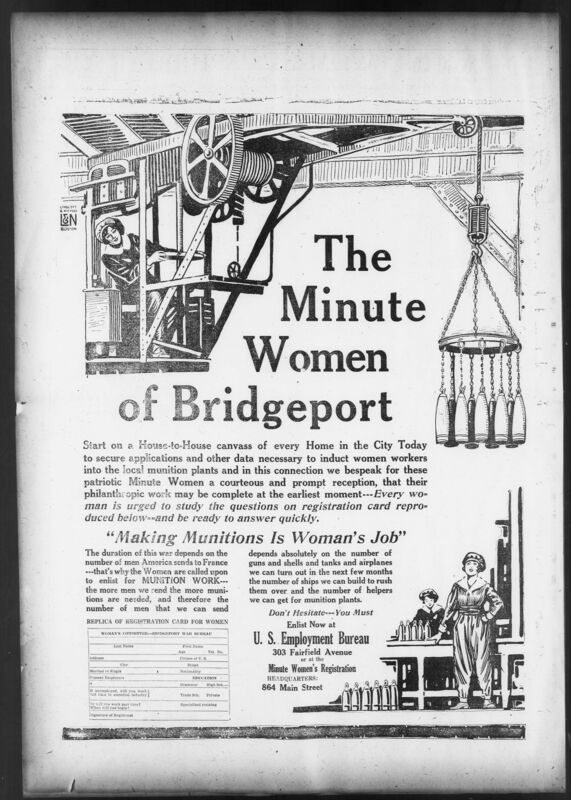 The working women of Bridgeport, immigrant and native-born, were deeply affected by American mobilization. The wartime boom gave them the confidence to strike in support of the eight-hour workday in 1915 and for other benefits in 1919. In short, the First World War gave exceptionally diverse groups of women the opportunity, and leverage, to advocate for political and economic enfranchisement. To explore the topic of women and World War I in online Connecticut newspapers, go to http://chroniclingamerica.loc.gov/, click on the “Advanced Search” tab, select “Connecticut,” select the years “1917-1918,” and enter these terms in the boxes called “with the phrase” or “with ALL the words.” You can also try a “proximity search” by using the box named “with the words within 5 words of each other.” To research issues related to women and the munitions production boom, use “1915-1918” as the year delimiter instead. “The Minute Women of Bridgeport Start on a House-to-House canvass. . . ,” The Bridgeport times and evening farmer (Bridgeport, Conn.), September 23, 1918, page 8. Chronicling America: Historic American Newspapers. of Congress. <http://chroniclingamerica.loc.gov/lccn/sn92051227/1918-09-23/ed-1/seq-8/>. Anthony, Susan B., Collection. Hartford History Center, Hartford Public Library. Hartford. Bucki, Cecelia. “Connecticut’s Industrial Fortress” in Bridgeport’s Socialist New Deal. Urbana: University of Illinois Press, 2001, pp. 11-40. Brown, Carrie. 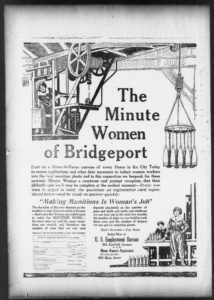 “From Corsets to Cartridges: Bridgeport, 1915-1916” in Rosie’s Mom: Forgotten Workers of the First World War. Hanover, NH: University Press of New England, 2002, pp. 45-68. Ehrenreich, John H. The Altruistic Imagination: A History of Social Work and Social Policy in the United States. Ithaca, New York: Cornell University Press, 1985. Higonnet, Margaret R. Nurses at the Front: Writing the Wounds of the Great War. Boston: Northeastern University Press, 2001. Kennedy, David M. Over Here: The First World War and American Society. New York: Oxford University Press, 1980, pp. 284-287. Nichols, Carole. Votes and More for Women: Suffrage and After in Connecticut. New York: Haworth Press, 1983. Found at the State Library at http://www.consuls.org:80/record=b1457044~S1. Steinson, Barbara J. American Women’s Activism in World War I. New York: Garland Publishing, 1982. The Suffrage News Bulletin, 1918-1920. Women’s Suffrage Archives. Hartford History Center. Hartford Public Library, Hartford. Woman Suffrage Association, Connecticut, 1869-1921 (RG 101). Connecticut State Library. Finding Aid available at <http://ctstatelibrary.org/RG101.html>. Woman’s Division, Council of Defense Records, 1917-1919 (RG 030). Connecticut State Library. Finding Aid available at < http://ctstatelibrary.org/RG030.html>. Zieger, Robert H. America’s Great War: World War I and the American Experience. Lanham MD: Rowman & Littlefield, 2000.